Spring is here, and it’s time for some super fruity desserts. People, I present to you one of the easiest and freshest pies to make: this fresh strawberry pie! Now, I didn’t grow up eating fresh strawberry pie. I’m not sure why, but I knew it was time to change that. 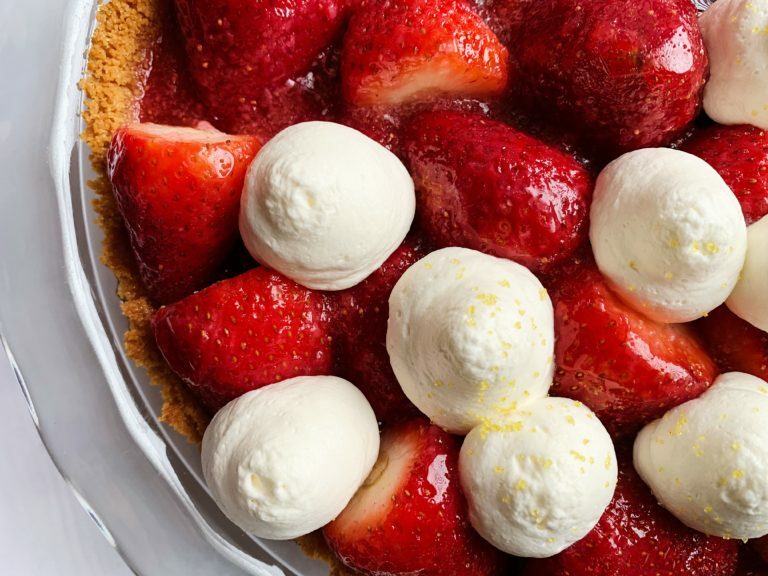 I think the first time I saw fresh strawberry pie was at Maddox in Perry, Utah. 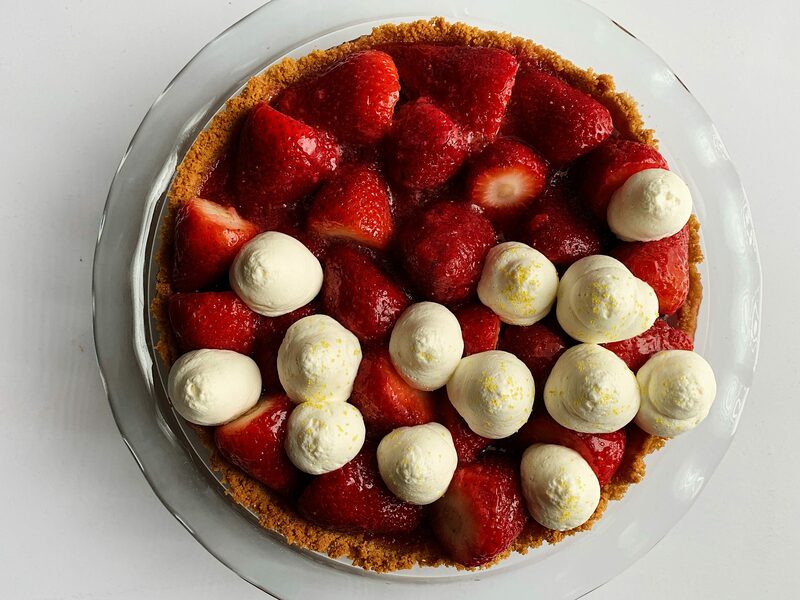 I was instantly intrigued–what was this mysterious pie piled high with fresh strawberries?! Every pie I’d had up until that point in time that involved fruit had been a baked pie. I loved the idea of having mounds of berries topped with whipped cream. Ha! So this year, I set out to make my own fresh strawberry pie. There was one thing I wanted to change, however, and that was the crust. Don’t get me wrong, I love a good flaky pie crust. But I wanted to see what the pie would be like with a cracker crust. And it wouldn’t be a regular old graham cracker crust, I was going for something lighter, slightly lemony, but still just as sweet as a graham cracker crust. Introducing the animal cracker crust! I’m not talking about the frosted ones, of course. Just the regular ol’ Barnum’s animal crackers that you can buy in the bag from the grocery store. When you break them into crumbs, mix them with butter and a little bit of sugar, something magic happens and they make quite a tasty crust. Next, I wanted to try making a pie without using strawberry Jello, which is a common standby with this type of pie. I went for a strawberry puree thickened with some unflavored gelatin and sugar with just the slightest hint of lemon. I think it helps intensify the strawberry flavor without being distracting and tasting artificial. If cooking with unflavored gelatin is intimidating to you, don’t let it scare you! I know I felt this way about it for years. What is this mysterious substance and what do you do with it? Well, maybe if you’re used to using Jello, then it isn’t intimidating. I’m not a regular Jello buyer so I don’t know my way around the stuff. Either way, when you’re using unflavored gelatin, all you have to do is bloom it in a little bit of water and then heat it up to boiling, making sure to dissolve it. This is usually done in the mixture that you’re adding the gelatin to, such as this strawberry glaze. Then it just needs to set in the fridge and you’re done! You can top the pie with whipped cream just before serving or you can serve it on the side. Either way, you’ll want to eat this pie within five hours or so. The sooner you eat it after it sets, the better! This would be a fantastic dessert for Easter. I hope you love it! 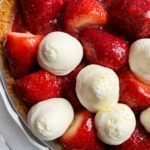 With loads of fresh berries, a flavorful cracker crust, and a tasty glaze, this is the perfect dessert for spring. Finely grind crackers using a food processor. (If you don't have a food processor, you can place them inside a ziplock bag and crush them with a rolling pin.) Add sugar and melted butter and pulse until just combined. Place crust mixture inside a deep dish 9" or 9.5" pie plate. Press the crust mixture into the plate evenly using the bottom of a glass or a measuring cup. Bake for 13-15 minutes or until the crust is lightly browned and fragrant. Remove from the oven and allow to completely cool. Briefly rinse and dry the strawberries, making sure to remove any excess water and moisture from the berries. Cut the green top off the strawberries. In a blender, puree about 1 1/2 cups of the strawberries to yield 1 1/2 cups of strawberry puree. Place the puree in a small saucepan and stir in the sugar. Mix together the gelatin and water in a small bowl and allow it to bloom for about five minutes. While the gelatin is blooming, bring the puree mixture up to a boil, then reduce to simmer for a few minutes. Add the bloomed gelatin to the puree mixture, stir well to combine and let it dissolve. Remove from the heat, stir in the lemon juice, then set aside to cool for about 15-20 minutes. Slice a few of the berries (maybe 6-8) in thin slices and arrange the slices evenly in the bottom of the pie crust. 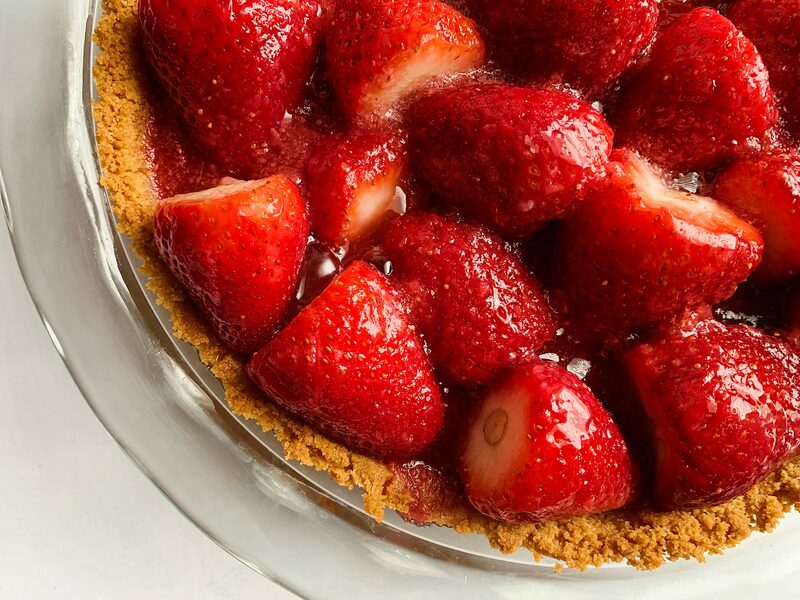 Fill the pie with whole strawberries until it looks full. You can arrange them however you'd like or dump them in, just make sure there are no large gaps. You want to cram the pie with the berries! Evenly pour the filling mixture over the strawberries, making sure to fill any gaps and to make sure it is evenly distributed. I also took my pastry brush and lightly coated the whole strawberries in the glaze so they're nice and shiny. Place the pie in the fridge to set for two hours. Using a stand or hand mixer, whip the cream until it starts to hold its shape. Add the sugar and vanilla extract and whip to stiff peaks. Serve with the pie. Pie is best eaten within a few hours after it is made. Enjoy!